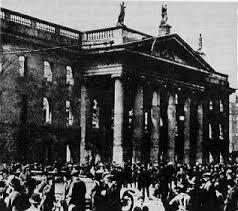 This month marks the 100th anniversary of the Easter Rising, also known as the Easter Rebellion. Occurring during Easter week, this armed insurrection was intended to end British rule in Ireland and establish an independent republic. Combatants hoped that Britain would be unable to contain them because of British troops being involved in WWI. Led by Padraig Pearse, the incident lasted six days. Members of the Irish Volunteers banded together with the Irish Citizen Army to seize key locations in Dublin and declare an Irish Republic. However, the rebellion failed for several reasons, one of which was a lack of weapons. The SS Libau was a German merchant steam ship that masqueraded as the SS Aud (a Norwegian ship that looked similar), in an attempt to smuggle a shipment of arms to the Ireland in preparation of the Easter Rising. Originally an English ship, it was captured by the Germans in 1914 and renamed. 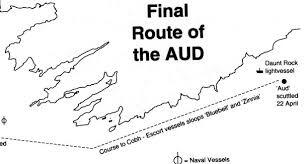 Conflicting reports exist as to why the Libau’s mission was unsuccessful. One article states the date of the delivery changed and the ship did not receive the information. Another report states the ship did arrive on time, but was blockaded by several British ships who had been on the lookout for German ships because of some code that had been broken. Regardless of the reason, because of the Libau’s failure to provide the 20,000 rifles, 10 machine guns, 1,000,000,000 rounds of ammunition, and explosives, the rebels did not have the armaments required to conduct the insurrection. Many Irish would hope for a German victory during WWII, with the thought that they would remove England from Irish soil and unify the country.